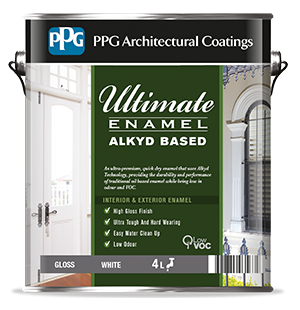 An ultra-premium, quick dry enamel that uses Alkyd Technology, providing the durability and performance of a traditional oil based enamel while being low in odour and VOC. Do not pour leftover paint down the drain. Unwanted paint should be brushed out on newspaper, allowed to dry and then disposed of via domestic waste collections. Empty paint containers should be left open in a well-ventilated area to dry out. When dry, recycle steel containers via steel can recycling programs. Disposal of empty paint containers via domestic recycling programs may differ between local authorities. Check with your local council first. Keep out of reach of children. Keep lid on when not in use. If swallowed Seek medical advice immediately and show the container or label. Do not induce vomiting. Eye contact Immediately flush eyes with running water for at least 15 minutes. Seek immediate medical attention. Skin contact wash skin with soap or recognized skin cleanser. Do not use solvents or thinners. Seek medical advice if irritation occurs. Call 0800 154 666 for 24 hour medical emergency response service. PPG Customer Service Call 0800 131 686 toll free or visit www.ppgpaints.co.nz for further information. Surfaces must be clean, dry and free from all surface contamination. Treat mould with bleach then rinse with clean water. Fill in the surface defects with suitable filler, putty or sealant. Avoid using masking tape on wall and ceiling paints. Remove all loose and flaking paint. No undercoat is required when painting over aged enamel providing the surface has been sanded thoroughly. Remove all loose and flaking paint and sand glossy or enamel surfaces thoroughly. Prime bare areas with a suitable PPG preparation product. To ensure an even surface when painting over patchy or contrasting colours apply a suitable PPG preparation product. Confirm colour before use. Apply two coats using a 5mm (length of nap or pile) roller or good quality brush. Avoid overspreading. If painting a large flat trim area, such as a door, apply by roller for best appearance. Up to 10 – 12m² per litre. Coverage will be lower on rough or absorbent surfaces. Alkyd based enamel paints yellow under certain conditions. Contact PPG Customer Service Department on 0800 131 686 for details. Scrape excess paint from equipment into separate container. Wash up with water. Do not dispose of paint or wash water in drains or sewers.